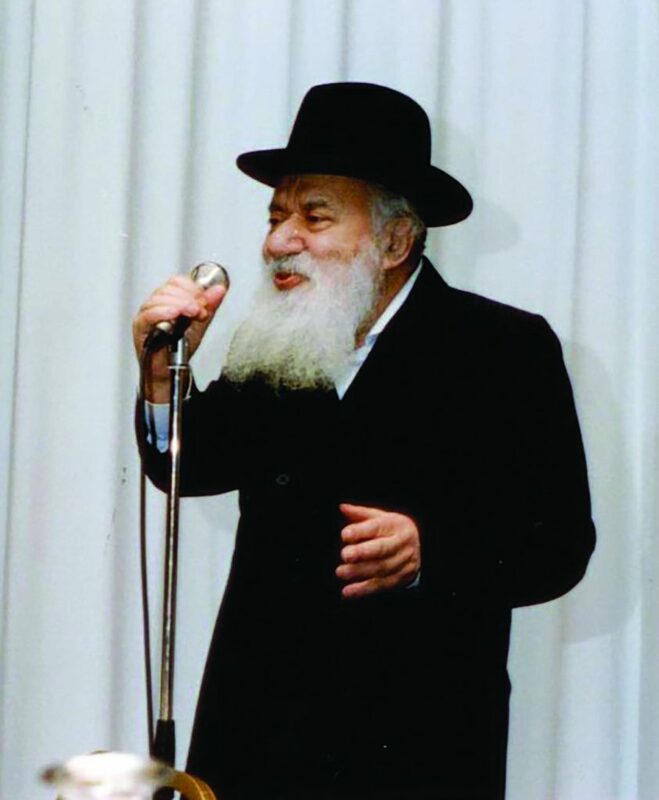 Harav Pinchas Hirschprung (5672/1912–5758/1998), whose 20th yahrtzeit was Sunday, 27 Teves, was a gaon olam who would dazzle his audience with his wide breadth of knowledge of Torah in every sphere. He served as the Chief Rabbi of Montreal, was Rosh Yeshivah of Yeshivas Tomchei Temimim in Montreal, founded the Montreal Community Kollel and built the Bais Yaakov of Montreal, named after him following his petirah. As great as he was in Torah scholarship, he was no less a paragon in middos and chessed, caring for all Yidden, no matter their background or affiliation. Rav Hirschprung was born in Dukla, Galicia. His parents were Rav Chaim and Leah Hirschprung. He first learned under his grandfather, Rav Dovid Tzvi Zehman, author of the Minchas Soless, and later became a talmid muvhak of Harav Meir Shapiro, zt”l, in Yeshivas Chachmei Lublin. He mastered all of Shas at a young age and would quote esoteric maamarei Chazal verbatim with ease. After Rav Meir Shapiro’s petirah, Rav Hirschprung was appointed to test talmidim for admission into the yeshivah. Rav Hirschprung escaped the Holocaust by traveling to Vilna and then on to Japan and Shanghai. He immigrated to Canada in 1941 and became the Rav of Kehillas Adas Yeshurun. He eventually was appointed the Rav of Montreal and was enormously influential in the growth of the Montreal kehillah. A talmid of Rav Hirschprung named a daughter Shulamith after his father whose name was Shalom. He and his wife were thereafter blessed with a son. He wanted to know whether he could now name his son Shalom after his father, or whether it is a problem to name two children after one person. Rav Hirschprung responded immediately, telling the talmid to look at the Rashi on Kesubos (89b), which says: “Rav Chisda had two sons and both had the same name; however, they called the older one Mar Kashishah and the younger one Mar Yanukah.” From this Rashi, it is obvious that two children may have the same name. Rashi, at the end of Parashas Noach (11:32), informs us that Avraham Avinu, for more than 60 years, did not fulfill the mitzvah of kibbud av, honoring his father, Terach. Avraham observed the entire Torah before it was given to Klal Yisrael, so why did he not observe this mitzvah? Indeed, the Midrash (Bereishis Rabbah 39:7) declares that Hashem told Avraham, “Lech, Ani potercha mikibbud av — Go, you are exempt from kibbud av.” Why is this? The Gemara (Brachos 10b) relates how Chizkiyahu Hamelech dragged the bones of his father, Achaz, on a bier made of rope at his funeral and the chachamim deemed this act praiseworthy. Rashi explains that since Achaz was a rasha, a wicked person, Chizkiyahu deliberately shamed his father by not giving him a dignified burial with a bier made of gold and silver. The Rambam (Hil. Mamrim 6:11) teaches that the mitzvah to honor one’s father applies even to a rasha, and the Shulchan Aruch (Y.D. 240:18) concurs with this ruling. If so, what right did Chizkiyahu have to dishonor his father? Rav Hirschprung notes the Gemara (Kiddushin 30b) that teaches that there are three partners in the creation of a person: Hakadosh Baruch Hu, his father and his mother. As Chazal (Bava Metzia 33b) explain, the reason one is obligated to honor his parents is that they are instrumental in bringing him into this world. Rav Hirschprung deduced that this reason applies only as long as the parent is satisfied with what he has created. In that case the child has an obligation of hakaras hatov to honor his parents. But if a parent wants to kill his child (chas v’shalom), he forsakes the title of father, and his son is no longer required to honor him. Terach, in Ur Kasdim, wanted to kill Avraham Avinu after the latter destroyed his father’s idols. Terach therefore forfeited the title of father, and Avraham was no longer obligated to honor him. This is why, as the aforementioned Midrash teaches, Hashem tells Avraham Avinu that he is exempt from honoring his father. The Gemara (Sanhedrin 63b) relates that Achaz, Chizkiyahu’s father, wanted to kill Chizkiyahu in a pagan ritual. Achaz too forfeited his title of father, releasing Chizkiyahu from the obligation of honoring him. Even the Rambam, who says a son must honor a father who is a rasha, would agree that where the father has forfeited his title of father by trying to kill his son, the son is no longer obligated to honor him. The Gemara (Sukkah 28a) relates that Rabi Eliezer was asked 30 questions concerning hilchos sukkah. Rabi Eliezer responded that he was familiar with 12 halachos, but with the 18 others he was not. Rabi Yose said just the opposite: He was familiar with 18 and not with the other 12. At first glance, this entire dispute is obscure, as we have no idea what halachos are being discussed. If so, what is this Gemara teaching us? Rav Hirschprung dazzlingly explains this dispute as follows. Rabi Eliezer is referred to (Shabbos 130b) as a “shamusi.” Rashi says this means either that Rabi Eliezer was placed in cherem — excommunicated, or that he was a talmid of Shammai. Rav Hirschprung records 12 halachos of Rabi Eliezer pertaining to sukkos, 11 in maseches Sukkah (11b, 2 on 19b, 3 on 27a, 4 on 27b, 31a) and one in maseches Shabbos (131a). Rav Hirschprung also records six halachos of Shammai pertaining to Sukkos (2 on Sukkah 3a, Sukkah 9a, Sukkah 15a, Sukkah 16b and Sukkah 22b). The Gemara (Bava Metzia 59b) teaches that Rabi Eliezer declared that he never related any halachah he had not heard from his Rebbi. Accordingly, the Tanna Kamma holds that Rabi Eliezer being a shamusi does not mean he was a student of Shammai, but that he was placed in cherem. Therefore he was familiar with only 12 halachos pertaining to Sukkos. Rabi Yose, however, holds that shamusi means that Rabi Eliezer was a student of Shammai. Therefore, besides the 12 known halachos he said pertaining to sukkos we have also the six halachos of Shammai, altogether 18 — 12 recorded in his name and six in the name of Shammai. Rabi Chanina ben Agil asks Rabi Chiya bar Abba (Bava Kamma 54b): Why is “tov” mentioned in the second Luchos and not the first? Rabi Chiya responds that he does not know whether “tov” is even mentioned altogether in the Luchos. What tov is Rabi Chanina referring to? Rashi teaches that this tov alludes to the words “l’maan yitav lach” stated in the Dibbur of kibbud av va’eim in the second Luchos. Rav Hirschprung offers another explanation regarding which tov is being discussed, based on the Recanati, one of the later Rishonim. The Recanati says that there are 17 more words in the second Luchos than in the first, 189 as opposed to 172. With this we can understand the question posed to Rabi Chiya as follows. Rabi Chanina is asking why there are 17 — the gematria of the word tov — more words in the second set of Dibros than the first one. Rabi Chiya responds that he never counted the words and thus does not know whether there are indeed 17 (the value of tov) more words or not. The Torah (Devarim 34:6) tells us that Hashem Himself buried Moshe Rabbeinu. How is this possible? A person who has passed away is tamei. How could Hashem, the epitome of taharah, handle the burial of Moshe? Rav Hirschprung explains that the Torah (ibid.) tells us, “V’lo yada ish es kevuraso — and no one knows his burial place.” This implies that no one knew where he was niftar either. Consequently, Moshe would have been considered a meis mitzvah. “Meis mitzvah adif, d’amar mar, gadol kvod habriyos shedochah es lo saaseh shebaTorah.” Even when the Kohen Gadol himself is a nazir, he may become tamei to assure a proper burial (Megillah 3b), because kvod habriyos outweighs other considerations. Rav Hirschprung was asked one Purim what size shoe Haman wore. Rav Hirschprung answered without hesitation: There are several Tosafos — Shabbos 92a; Eruvin 48a; Chagigah 11a; Bava Basra 100b — that teach that Haman and his ten sons were hanged after being decapitated, and they were each three amos tall. While the height of a person is normally three and a half amos, without a head a person would be only three amos tall. The Gemara (Eruvin 42a) says: “If someone is walking and does not know the techum Shabbos (how far one may walk outside a town on Shabbos), he should walk 2,000 medium footsteps. The Magen Avraham (397:1) rules in this context that a person’s foot size is normally half an amah. The Magen Avraham says further that the half-amah includes the shoe. Rav Hirschprung concluded that since Haman was normal size, his foot size would be half an amah. Needless to say, the people present were astonished with the genius and brilliance of his answer. Rabbi Menachem Pollak, known as Reb Mendy Pollak, learns and teaches Torah on Manhattan’s Upper West Side.